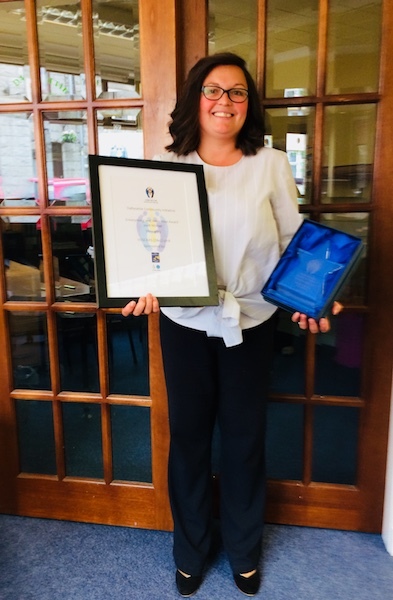 Michelle McRobert, Business Manager at Dalbeattie Community Initiative, is delighted to report that DCI scooped the 'Most Enterprising and Innovative' Award at the Third Sector VOSCARs award ceremony in Dumfries. Said Michelle, "This award is testament to the thousands and thousands of hours given to our group by YOU, our volunteers; this enables our projects and events to grow and succeed. I would like to extend my thanks to all of you for your continued time and dedication." The VOSCARs (D&G) recognise outstanding volunteers within the Dumfries and Galloway area and around 200 nominations were received this year. Volunteers from across Dumfries and Galloway gathered in Dumfries on June 7th for the fourth annual Awards ceremony. Pictured is Michelle McRobert receiving the award on behalf of Dalbeattie Community Initiative's many volunteers.